Effective, premium hair care inspired by nature and science. Our hair care products are formulated to promote healthy hair growth by treating common hair concerns like dryness, breakage, thinning hairline, coarse hair and slow hair growth. I have literally used the products for a day and must say I am really impressed, my her was breaking n very dry, I was on the verge of going bold, after using the washing my hair with the shampoo and using the deep treatment , and finishing it off with the hair butter and hair growth oil, i am keeping my hair, it is fuller and is glowing, the is less breakage. 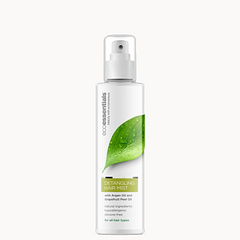 I have been enjoying using the product, especially the detangling mist. I am yet to observe hair growth (early days) but I have committed to give it a try for a few months and follow the tips on your website. 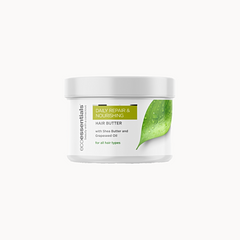 I'm loving the butter so far, its only been 2 weeks but i'm starting to see a difference,i gives my hair ice volume. A day after using the collection (Anti-breakage, Nourish and Repair collection) my hair was fuller and now (14 days later) my hairline is already making a come back! I am sold on these products! Your product is absolutely wonderful. I love the hair butter and the growth oil. Eco Essentials Hair Growth oil, Hair Butter, Shampoo, Conditioner and de tangling hair spray. I love the Butter and Growth oil!! Make my hair feel sooo soft. I am so loving my hair right now, the texture, the length. in a space of 2 weeks and already I am seeing the difference. Thank you so much. Leaves my hair feeling soft and moisturized and easy to manage. I started seeing amazing results in the first few days of usage. My hair is really moisturized and my curls are more defined. My hair had really bad heat damage but the hair butter has really treated that especially as I'm in month 6 of my transition to natural hair. My hair has become softer and believe it or not, my curls look healthier! Extremely impressed with how quick my order was delivered. Overall: I’m happy with the products and would totally recommend them. Not only does it boost the growth of my hair it is also an incredibly amazing edge controller, especially on cornrows. its been a few day, but i feel like my hair loves the product. I am a happy customer!! My hair feels like it has more volume and it is nourished and moist! My hair just love the whole range. My hair instantly felt moisturized when i applied the revitalising conditioner when i detangle. The Hair Mist is a gift from the Gods. Detangling literally takes me 5 minutes. The hair butter is going to be a staple in my regimen. A little goes a long way and my hair don’t feel weighed down at all. The hair growth oil, just gives that extra shine to my hair and feels so good after i massage it into my scalp. Living up to its name, this combo has really helped with my low porosity hair; restoring, nourishing and having a glow like never before. I'm loving the natural ingredients and the hair growth oil smells great! True value for money. i am loving the product, i have noticed my hair is no longer dry and it is very soft and easy to manage. My hair is super moisturised since I've started using ecco essential and it leaves it looking shiny. I have a very dry scalp but oil keeps my scalp so happy.